Getting Married In Classic Boat Style! 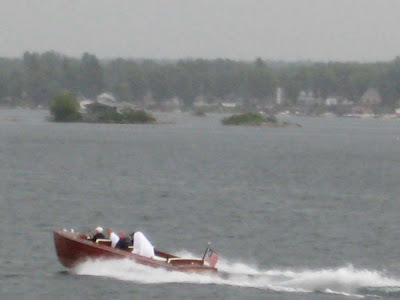 The only downside to getting married in the Thousand Islands is…. what happens when it rains? I was able to grab this shot of the poor bride being hauled to her reception.. I hope, and not her wedding, on a rainy day… So that is what the veil is for? What a great idea though. So if you are planning on a marriage, consider a woody boat rather than the old boring limo… And no, on a trailer is not cool. I just used my Woody Boat last weekend to shuttle a good friend and his new bride to their reception. The wedding was in Sandpoint, Idaho (a 6 hour drive away from home!) with the reception at a beautiful lakeside lodge. I spent most of the rest of the reception taking guests out for quick rides. I have never had so much fun at a wedding! Any excuse to go Woody Boating! Now I am back in the car for a trip to the International ACBS show. The weather and pre-events have been fantastic. Meetings today and show starts tomrrow. Already many, many interesting and high quality boats here. Expect somewhere around 110, I am told.